Orissa, situated on the eastern cost of India along the Bay of Bengal, was first hit by a Cyclone on 18 Oct 1999 affecting the coastal districts of Ganjam, Puri, Jagatsinghpur, Khurda, Gajapati and Balasore. As and when, the Arya Veer Dal Delhi Pradesh Officials got the first intimation about this huge disaster, an emergency Meeting was called at Arya Samaj Birla Lines, New Delhi. A team of AryaVeers (Arya Veer Dal Sewa Samiti) was formed under the leadership of Sh. Virender Arya. 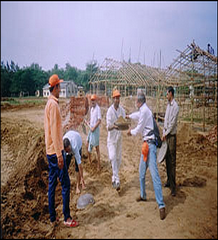 The team left for the affected areas, same day.On reaching the affected areas of Orissa, the Sewa Samiti found that subsequently, the State was hit by a Super Cyclone on 29 Oct 1999 with winds of more than 260 Kph, tidal waves rising 20 feet high and torrential rains. The Super Cyclone and its aftermath caused “severe” damage in the districts of Jagatsinghpur, Balasore, Cuttack, Puri, Nayagarh, Jajpur Kendrapada, Bhadrak and Khurda and “moderate” damage in the districts of Mayurbhanj, Dhenkanal and Keonjhar. Not only the Human Beings, even the plantation was badly damaged. No living thing was seen for miles.Finally, Sewa Samiti decided to initiate rescue work in a district that was worst affected. Swami Dharmanand Ji was also working alongwith the team members of Sewa Samiti with food material. In the first phase, after deep discussion with Delhi Sabha, Sewa Samiti decided to re-incarnate the houses destroyed. The Plan was initially to provide shelter to 13 families, which were extended to 268 families of 3 villages. The villages were renamed as Dayanand Palli, Dayanand Pada and Dayanand Puri. Every rehabilitated family was provided Ration enough for next 2 months, Clothes, Shoes, Bedding, Fuel, Utensils, etc. to encourage them to restart their life. Consequently, AryaVeers were treating the land with DDT to de-infect the Villages for prevention of further epidemics. Medical Services alongwith medicines, Ration and clothes were provided in several other villages. AryaVeers did funeral of several unknown dead bodies with Vedic principles, which were found till the end of 3 months.Orissa Cyclone Rescue Operation was the biggest organised Rescue Operation of Arya Samaj till date, in which AryaVeers provided voluntary services for more than 4 months. The Sewa Van provided by Jay Bharat Maruti played a major role in this Operation.